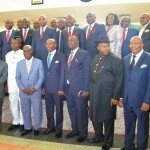 The 20 Commissioners and two Special Advisers who were earlier sworn in today by His Excellency, Governor Udom Emmanuel have been assigned their portfolios. Barrister Uwemedimo Thomas Nwoko is the Attorney-General/Commissioner of Justice, Mr. Akan Okon is the Commissioner for Finance, Dr. Mathew Nathan Ekaette is the Commissioner of Agriculture and Natural Resources, while Mr. Ephraim Akparawa Inyang-eyen is the Commissioner for Works. Others are Prince Godwin Ntukude, Commissioner of Transport. Rt. Hon. (Elder) Aniekan Simon Akpan is the Commissioner of Education, while Dr. Dominic Ukpong is the Commissioner of Health. Rt. Hon. Uwem Ita Etuk is the Commissioner of Lands/Town Planning. Mr. Enobong Emmanuel Uwah is the Commissioner of Housing and Urban Renewal. Dr. Iniobong Ene Essien is the Commissioner of Environment and Mineral Resources, while Mr. Aniekan John Umanah is the Commissioner of Information and Communications. Rt. Hon. Victor Etim Antai is the Commissioner of Local Government and Chieftaincy Affairs while Barrister Emmanuel Moses Enoidem is the Commissioner of Investment, Commerce & Industry. Rt. Hon. (Barrister) Ekong Sampson is the commissioner of Rural Development, while Dr. Emmanuel Ating Onwioduokit is the commissioner for Economic Planning and Development. Dr. (Mrs) Elizabeth Donald Obot is the Commissioner of Science and Technology while Otuekong Emmanuel Udo Ibiok is the Commissioner for Culture and Tourism. Dr. Glory Emmanuel Edet is the Commissioner of Women Affairs and Social Welfare while Sir. Monday Ebong Uko is the Commissioner of Youths and Sports. Engr. Etido Inyang is the Commissioner of Special Duties. The Special Advisers have also been assigned their portfolios and they are: Bureau of Labour, Productivity and Manpower Planning to be headed by Mr. Enyinna Ekpenyong while Rt. Hon. Anietie Sunday Etuk will head the Bureau of Political and Legislative Affairs. The posting of the above commissioners takes immediate effect.